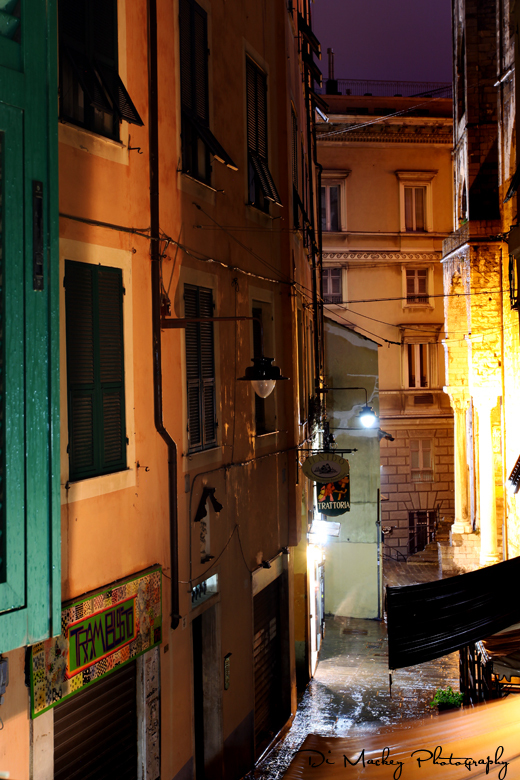 There is something truly delicious about lying in bed here in Genova, listening as the street comes alive … the first footsteps, the quiet voices, followed by louder voices as people roll up the doors of their work place, and the clank of the coffee cups on saucers begins soon after. I doze a while longer then wake again, this time to the laughter of men on the street below. I imagine them stopping for an espresso at the cafe as they head off to work … friends who meet everyday, on their way, and I envy them their routine for a moment. There’s music but I nap just a little more … until it becomes impossible to ignore my craving for focaccia. I pull on clothes and step out, almost into a neighbour. She laughs and apologises in Italiano. I reply in French for some early-morning-not-quite-awake reason. The bonjour feels strange in my mouth and I only recover when I find her holding the street door open for me and I say ‘Grazie’ and smile ... located in place and time. I have some days without shape or form ahead of me, days where I can organise the creative chaos of my life. I have been waiting so long to reach this place of peace and isolation in the midst of the everyday noise of the ancient city. For me, wandering is rarely about sights seen. When I was in Cairo I only saw pyramids as my plane climbed up through the pollution and left the city however I met some truly interesting people. And so it is that my idea of travel is more about people and the feeling of place. Barcelona was the first city in recent years that forced me to be the tourist, perched on the outer shell of the city, excluded from everyday life by virtue of being foreign and without people who knew me. Here, back in Genova, I’m always a little off-balance and shyness hunts me down easily but it is good to be back in La Superba and writing again.